""Addiction is a family disease. One person may use, but the whole family suffers."" Sometimes one look is all that is needed to set the stage for what an audience should come to expect from a film. When Ben Burns (Lucas Hedges) surprises his family by showing up for the Christmas holidays, it is his mother's eyes that convey everything needed to set the tone for the ensuing story. Julia Roberts expresses all of the emotion of Holly Burns, a parent who has been through extreme turmoil with her child, but who still holds out hope for his redemption. This opening scene touches on the harsh realities experienced by so many families around the world whose lives have been deeply affected by illicit drugs and their impact on loved ones. Writer and director Peter Hedges’ film, Ben is Back manages to depict the harsh realities of substance abuse and its effect on the Burns family, when their Christmas is interrupted by the sudden arrival of their eldest son. Ben is supposed to be in rehab for drug addiction, but says that his sponsor encouraged him to come home for the holidays. The young addict manages to win back the hearts of his mother and his two younger siblings in due time, but the veneer of his deception quickly begins to crack. The destructive history that he left in his wake quickly rushes back in to haunt him and his family. Each small step in their day unearths ghosts from his days of addiction, as they travel through the local shops, go to church for an evening service and during attendance at an Alcoholics Anonymous meeting. Many of the people in the community and in their family find it hard to believe that Ben has changed, which he slowly begins to prove. The tension of the day builds until the family comes back from celebrating a Christmas church service and they find that their house has been ransacked. The thieves merely take the family dog, Ponce, who holds a special place for each family member and draws Ben and Holly out into a hunt for the perpetrators. It is during this ride throughout the suburbs where the loving and protective mother learns more of her son’s dark past and does all she can to save him from himself. Even though her son does not want her help, it is his love for his family that leads him to make amends for all the pain he has inflicted on their family. The screenplay encompasses a familiarity that is reticent in the modern cinema on the subject of drugs, family, and desired restoration. 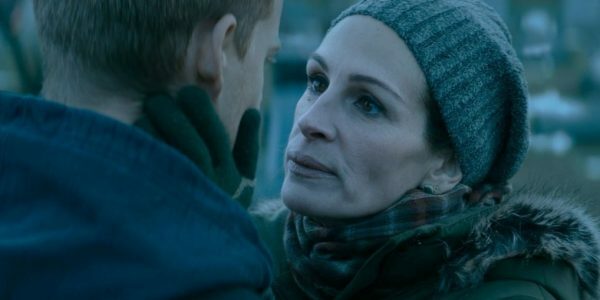 Julia Roberts delivers a bittersweet portrayal of a mother who must work through the extremes of parental emotions. As each layer of the family’s story unfolds and Ben’s murky past is made even more evident, Roberts must reach deep to deliver on this visceral and emotive role, proving that she can be both tough on her wayward son while still holding onto the hope that she can pull her boy out of this self-destructive abyss. A flawed, but human example of parenting that may give hope to those who strive to fight for the safety and well being of their children while still loving them with unconditional love. Lucas Hedges manages to hold his own on-screen with the Academy-Award winning actress by delivering an unnerving and convincing combination of the addict and the loving son. This award-winning actor manages to encompass the physicality of the script written by his writer/director father with the simplest of looks and twitches that will be familiar to anyone who has experienced this in the people in their lives. This is best portrayed in the scene at a support group where he shows the unhealthy mixture of confession, manipulation and euphoria that can come during the public acknowledgement of an addict’s ailment. Even with these outstanding performances, this is not for those looking for a feel-good film or the stock standard Julia Robert rom-com. What this movie does offer audiences is a brief and gripping glimpse into the devastating effects of substance abuse. A story that will awaken those who think that this could not happen in their family’s world and should motivate parents to do all they can to discourage anyone they love from considering drugs. Due to the explicit depiction of this darker side of society, the writers do include coarse language, depictions of drug use and attempted suicide. Ben is Back is more of a life-lesson for society than an example of hope in this dark world. A narrative that shows the importance of parents in the lives of their children and though we cannot always protect them from all of the evils of this world, mothers and fathers can be the constant example of love throughout the ups and downs of life.